The winner of this year’s Fresh Milk ‘My Time’ Local Residency, Anisah Wood, will be in residence with us between June 6 and July 1, 2016. As part of her community outreach during her residency, Anisah will be offering the programme Quid Pro Quo – a series of skill-exchanges at the Fresh Milk studio. Modeled after the Trade School concept, founded in part by New York based artist Caroline Woolard whose practice “explores intersections between art and the solidarity economy,” these sessions will become a non-traditional space of learning and sharing, emphasizing the value of people’s passions and skills. Quid Pro Quo will be held at Fresh Milk over a period of four weeks, with the first session being held on Friday, June 10, 2016 at 3:00pm. Each participant must be willing to share either one’s passion, skills or knowledge in exchange for the skills or knowledge of the other participants. Each participant can offer an option of 2 to 3 topics or skills. For example, Anisah will offer: ‘Digital photography 101’, ‘The art of collage’ and ‘How to play warri and potta (traditional board games)’. Note that what is offered does not have to be art oriented. The idea is simply to share knowledge with the expectation of receiving knowledge in exchange. The result is at most a 4 for 1 exchange. The setting in which the information is dispensed will be informal and the manner in which each participant relays the information is completely up to the individual. It can be a discussion, hands on experience, a series of exercises, a presentation etc. Each participant will select from the options offered what they would like to know from the other participants. The option that receives the most votes will be the one discussed. Finally, each participant will be assigned a day in which they will give their presentation, with the option of Tuesdays, Wednesdays or Fridays with flexible hours between 3:00-6:00 pm. There will be a limited number of participants approximately 4-5 in order to allow the exchange to be completed within the duration of the residency. 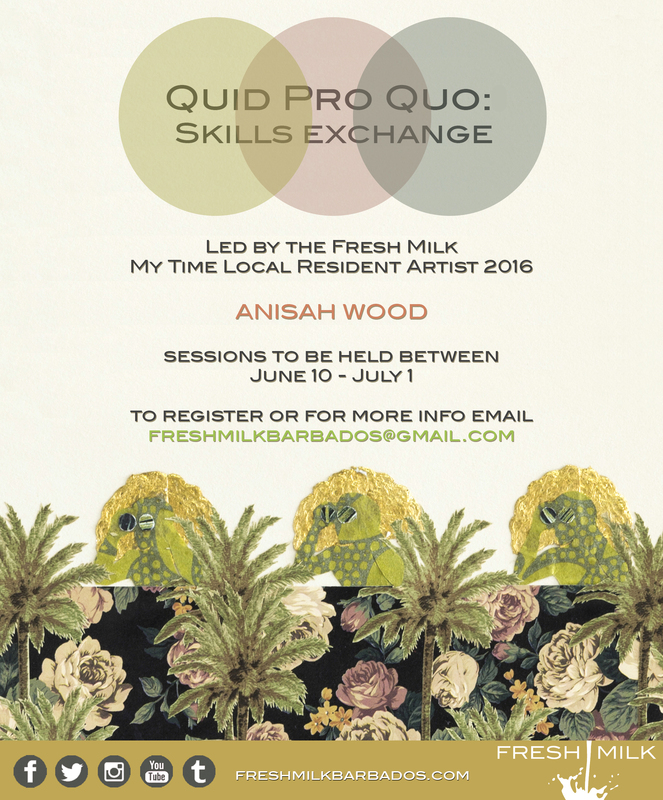 To register, email freshmilkbarbados@gmail.com with the subject line ‘Quid Pro Quo’ and provide your name, contact information and the knowledge to be bartered in exchange for one of the skill-sets Anisah will be offering by June 7, 2016. From the response, the participants will be selected and informed of their acceptance by June 9, 2016, in time for the initial session on June 10 at 3:00 pm. During this meeting, each of the participants will be assigned a week from which they will determine what day and time they will be hosting their session. The participants will then vote on the focus of each session based on the options provided.